Importance. -- This defoliator is common throughout eastern North America. It feeds on all species of oaks, but prefers the white oaks. Some infestations have covered millions of acres - retarding growth and tree vigor. Outbreaks usually subside after 2 to 3 years, before serious tree mortality occurs. Identifying the Insect (figure 4a). -- Caterpillar coloration is variable, but is generally yellowish green with a narrow white stripe down the center of the back, bordered dorsally with reddish-brown, and one or two yellowish stripes on the sides. Mature larvae may reach 1.5 inches (37 mm) long. The adult moth is ashy grey with three dark wavy lines across the forewings. Identifying the Injury (figure 4b). -- Young larvae skeletonize the leaf while older larvae devour the entire leaf except the leaf stalks and main veins. There are two periods of defoliation - one in June to July and another in August to October. Biology. -- There are two generations in the South and one generation in the North. In the South, the larvae feed from early May until late June, and pupate in the soil. Second-generation larvae feed from mid-August until late September, then move to the ground to spin cocoons and overwinter as prepupae. Larvae of the single generation in the North are present during June to midAugust. Control. -- Insect parasites and predators eat the eggs and larvae of this pest. Winter mortality also helps keep most infestations in check. Chemical control is occasionally needed to protect high-value trees. Figure 4. 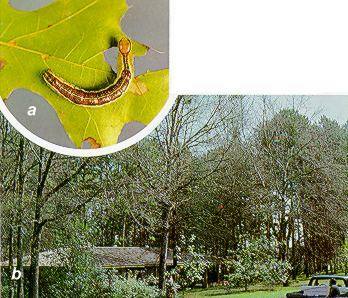 (a) Variable oakleaf caterpillar larva; (b) defoliation by variable oakleaf caterpillar in residential area.